If you haven’t already heard, we at Calcagni Real Estate are very excited to see that CHESHIRE, CT made the 2013 Top 50 Money Magazine list of best small towns to live! Cheshire is one of only 3 Connecticut towns that made the list! We certainly know what makes our town so special, and are glad to know that it was recognized by a national publication such as Money Magazine! This former farming community still feels like a quintessential New England village, filled with horse barns, gardens, and towering trees. Cheshire’s proximity to New Haven, Hartford, and Bridgeport gives residents plenty of options when it comes to jobs, though locals say the traffic can make even short commutes painful. 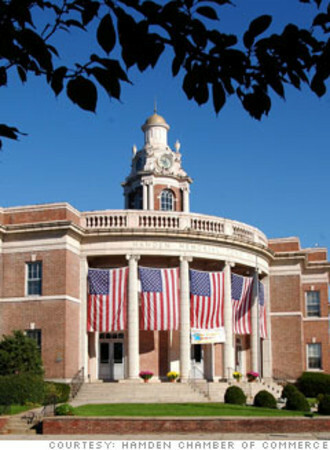 Hamden, CT has made the top 100 places to live in the US, according to CNN and Money Magazine’s “ 2012 100 Top Places to Live List”. Hamden came in at an impressive number 54. The town has consistently won a place on the list. In 2008, Hamden was ranked 33 and in 2010 it was ranked 87. “The Land of the Sleeping Giant’s mountains, hills, and parks coupled with Quinnipiac University’s college-town energy make this classic New England town the ideal abode for many growing families,” according to their site. There are lots of fun things to do with your family to get into the Holiday Spirit this season! Check out the link below to find local Holiday Events going on throughout CT.. Do you have any of your own recommendations? Please share!